The Rose Center for Earth and Space is a part of the American Museum of Natural History in New York City. The Center's complete name is The Frederick Phineas and Sandra Priest Rose Center for Earth and Space. The main entrance is located on the northern side of the museum on 81st Street near Central Park West in Manhattan's Upper West Side. Completed in 2000, it includes the new Hayden Planetarium, the original of which was opened in 1935 and closed in 1997. Neil deGrasse Tyson is its first and, to date[update], only director. The center is an extensive reworking of the former Hayden Planetarium, whose first projector, dedicated in 1935, had 2 successors previous to the current one. The original Hayden Planetarium was founded in 1933 with a donation by philanthropist Charles Hayden. 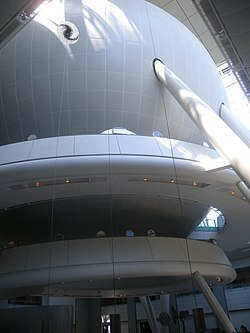 In 1935, the Hayden Planetarium, designed by architects Trowbridge & Livingston, opened, after its construction was funded by a $650,000 loan from the Reconstruction Finance Corporation and a $150,000 donation from banker Charles Hayden of Hayden, Stone & Co. Its mission was to give the public "a more lively and sincere appreciation of the magnitude of the universe... and for the wonderful things which are daily occurring in the universe." Joseph M. Chamberlain, hired as an assistant curator in 1952, became Chairman of the Planetarium in 1956. In 1960, a Zeiss Mark IV projector was installed, followed by a Zeiss Mark VI projector and new seats in 1993. In January 1997, the original Hayden Planetarium was closed and demolished. In August 1999, a new, customized Zeiss Mark IX projector was installed, accompanied by a digital dome projection system that provides a 3-D visualization of the universe based on images generated in real time by a Silicon Graphics supercomputer. On February 19, 2000, the $210 million Frederick Phineas and Sandra Priest Rose Center for Earth and Space, containing the new Hayden Planetarium, opened to the public. The Rose Center is named after two members of the Rose family, and was designed by James Polshek and Todd H. Schliemann of Polshek Partnership Architects with the exhibition design by Ralph Appelbaum Associates. Tom Hanks provided the voice-over for the first planetarium show during the opening of the new Rose Center for Earth & Space in the Hayden Planetarium in 2000. Since then such celebrities as Whoopi Goldberg, Robert Redford, Harrison Ford, Liam Neeson and Maya Angelou have been featured. Back to front: the Hayden Sphere, the Heilbrun Cosmic Pathway, and the Scales of the Universe exhibit. Close-up of the Scales of the Universe exhibit. The Hayden Sphere with the winding Cosmic Pathway helix. Designed by Polshek and Todd Schliemann, the building consists of a six-story high glass cube enclosing the 87-foot (27 m) illuminated Hayden Sphere, which appears to float, although it is actually supported by truss work. Polshek has referred to this work as a "cosmic cathedral". The Rose Center and its adjacent plaza are both located on the north face of the Museum; the Center encloses 333,500 square feet (30,980 m2; 3.098 ha) of research, education, and exhibition spaces, in addition to the Hayden Planetarium. Also located in the facility is the Department of Astrophysics, the newest academic research department in the Museum. Furthermore, Polshek designed the 1,800-square-foot (170 m2) Weston Pavilion, a 43-foot (13 m) high transparent structure of "water white" glass along the Museum's west facade. This structure, a small companion piece to the Rose Center, offers a new entry way to the Museum, as well as opening further exhibition space for astronomically-related objects. The planetarium's original magazine, The Sky, merged with another journal, The Telescope, to become the leading astronomy magazine Sky & Telescope. The exhibits highlight human connection to the cosmos along with the scale and properties of the observable universe itself. When the new Rose Center opened with a model of only eight planets, excluding Pluto, which had been thought of as the ninth planet, it resulted in a headline-making controversy. For the Charles Hayden Planetarium in Boston, see Museum of Science, Boston. 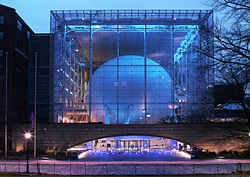 The Hayden Planetarium (often called "The Hayden Sphere" or "The Great Sphere") has, since 2000, been one of the two main attractions within the Rose Center. 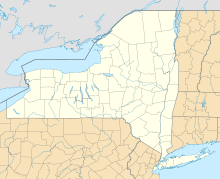 It was established by the State of New York in 1933, some of the funding coming from philanthropist Charles Hayden. The top half of the Hayden Sphere houses the Star Theater, which uses high-resolution fulldome video to project “space shows” based on scientific visualization of current astrophysical data, in addition to a customized Zeiss Star Projector system replicating an accurate night sky as seen from Earth. The Star Theater is one of the world's pre-eminent planetariums, which incorporates high-resolution full-dome video to create "space shows", based in scientific visualization of current astrophysical data. The Big Bang Theater, which occupies the bottom half of the Hayden Sphere, depicts the birth of the universe in a four-minute program. Utilizing a screen that measures 36 feet (11 m) in diameter over an 8-foot-deep (2.4 m) bowl, a four-minute program depicts the birth of the universe, with narration by Liam Neeson. The Big Bang Theater serves as an introduction to the Heilbrun Cosmic Pathway, a spiral which wraps around the sphere, connecting the second and first floors of the Rose Center. The cosmic pathway provides a timeline of the universe's history from the Big Bang to the present day. The Heilbrun Cosmic Pathway is one of the most popular exhibits in the Rose Center, which opened February 19, 2000. The Hayden Planetarium offers a number of courses and public presentations including the Frontiers of Astrophysics and Distinguished Authors lecture series. The Ross Terrace adjacent to the Rose Center for Earth and Space, and built over the new parking garage on 81st Street. This rooftop plaza is designed to be a stage set that celebrates both astronomy and Earth’s natural history, as well as an outdoor gathering place for museum visitors. Renowned garden designer Kathryn Gustafson formed the concept for the Terrace after seeing an illustration of shadows cast by a lunar eclipse. A terrace covering 47,114 square feet (4,377.0 m2; 0.43770 ha) was designed by Charles Morris Anderson as a Landscape Architect, and his design was awarded the American Society of Landscape Architects (ASLA) Design award in 2003. As of 2015[update], five shows have premiered in the theater. The first show, Passport to the Universe, opened with the new theater and features the voice of Tom Hanks as a guide along a voyage from Earth to the edge of the observable universe. The Search for Life: Are We Alone? debuted in 2002, with narration by Harrison Ford describing the possibilities of extraterrestrial life. Opened in 2006 and narrated by Robert Redford, Cosmic Collisions examines the role that impacts have played in shaping the universe—including visualizations of Earth's magnetosphere, the formation of the Moon, and the meteorite impact that contributed to the end of the age of dinosaurs. Journey to the Stars, narrated by Whoopi Goldberg, premiered on, July 4, 2009, featuring extraordinary images from telescopes on the ground and in space and stunning, never-before-seen visualizations of physics-based simulations. Dark Universe, narrated by Neil deGrasse Tyson, premiered on November 2, 2013. Other exhibits can be found outside the sphere. The Gottesman Hall of the Planet Earth has displays that illustrate the Earth's geological history and weather patterns. The Cullman Hall of the Universe focuses on topics ranging from planets to stars, life on other worlds to current cosmology. The Scales of the Universe exhibit makes comparisons between the size of the Hayden Sphere and other objects in the universe presented at appropriate relative scale. There is also a photographic exhibit about the Apollo moon landings. The photographs are throughout the first floor level of the Rose Center. 1979: The planetarium appears as a backdrop for scenes in the film Manhattan. Woody Allen and Diane Keaton play characters who walk around within the planetarium after escaping from a sudden downburst of rain. 2001: The planetarium is briefly seen in the film K-PAX starring Kevin Spacey and Jeff Bridges. 2002: The planetarium is briefly seen in the film Men in Black II starring Tommy Lee Jones and Will Smith. 2003: The planetarium features briefly in the film Eloise at the Plaza starring Sofia Vassilieva and Julie Andrews. 2011: The planetarium is used as part of an investigation in the White Collar episode "Where There's a Will" (S03E02). 2014: The planetarium is briefly seen in the film Night at the Museum: Secret of the Tomb starring Ben Stiller and Robin Williams. ^ Gray, Christopher (1996-08-16). "A Remnant of the 1930s, and Its Sky, Will Fall". The New York Times. Retrieved 2009-03-18. ^ Martin, Douglas (December 11, 2011). "Joseph Chamberlain, 88, Dies; Brought the Stars a Bit Closer". New York Times. Retrieved 19 December 2011. ^ Goldberger, Paul (2000-01-17). "Stairway to the Stars". The New Yorker. Retrieved 2009-03-03. ^ Glancey, Jonathan (2000-05-08). "A cosmic cathedral on 81st Street". The Guardian. London. Retrieved 2009-03-18. ^ deGrasse Tyson, Neil (February 2, 2001). "Astronomer Responds to Pluto-Not-a-Planet Claim". Space.com. Retrieved 2013-07-17. ^ "Timeline: The History of the American Museum of Natural History". Archived from the original on 2009-03-10. Retrieved 2009-03-03. Wikimedia Commons has media related to Rose Center for Earth and Space.